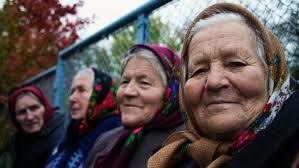 Approximately 100 women defiantly cling to their ancestral homeland in Chernobyl’s radioactive “Exclusion Zone.” While most of their neighbors have long since fled and their husbands have gradually died off, this stubborn sisterhood is hanging on — even, oddly, thriving — while trying to cultivate an existence on toxic earth. Why do they insist on living on farms that the Ukrainian government and radiation scientists have deemed uninhabitable? How do they manage to get by, isolated, in an abandoned landscape guarded by soldiers, and rife with wild animals? How has the radiation affected them these past 29 years? At her cottage, Hanna Zavorotyna brews homemade moonshine and slices thick chunks of salo, raw pig fat – though it is strictly forbidden to eat local food. “Starvation is what scares me, not radiation,” she says. That stark choice reveals an incredible journey the women have traveled: from Stalin’s enforced famines in the 1930s, through Nazi occupation, to nuclear disaster. Like the wolves, moose, wild boar and other wildlife not seen for decades that have come back to the abandoned forests around Chernobyl, the women of the Exclusion Zone, too, have an extraordinary story of survival, and offer a dark yet strangely affirming portrait of life post-apocalypse.